The great speciality of the Hugel family for many generations, these wines are produced from grapes which have over-ripened on the vine, and are picked much later than the normal harvest. The action of "noble rot" (botrytis) gives these wines almost unlimited ageing potential and they are frequently described as some of the finest white wines in France. 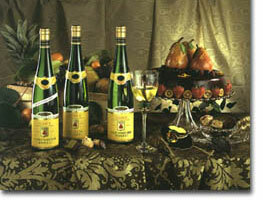 The pride and joy of the Hugel family, pioneers of late-harvest wines in Alsace. A wine of extraordinary depth and concentration, which will develop in bottle for decades, it is best enjoyed on its own, for a special occasion. Extremely rare, produced from forty-year-old vines in exceptional vintages. Difficult to achieve but the result amply rewards the effort. After ten years in bottle, the wine is a symphony of elegance, finesse and sheer class, a perfect match for a fine fish dish in sauce. An extraordinary wine with a rich, golden colour and incomparable bouquet of ripe, preserved fruit. Tender, velvety and suave, it allies opulence, richness and structure, without heaviness on the palate. A wine to age, ideal with foie gras or black truffles. To produce such rare wines, certain factors have to coincide : an exceptional vineyard, old vines, perfect maturity, early-morning mist followed by maximum sunshine, to encourage the development of "noble rot" (botrytis cinerea). The shrivelled grapes are then carefully harvested, one by one, then vinified with utmost care. The resulting nectar has unbelievable finesse and complexity, and its lifespan is practically unlimited.